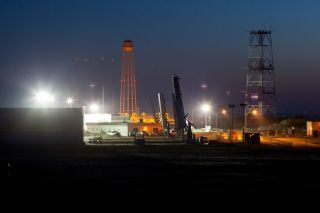 Four of the ATREX rockets stand in the vertical launch position during a night-time dress rehearsal at the Wallops Flight Facility on March 15, 2012. Five suborbital rockets will be launched in just over five minutes as part of ATREX. This story was updated March 23 at 8:49 p.m. ET. UPDATE: NASA called off the March 22-23 launch attempt of the five-rocket ATREX mission to create glowing cloads in the U.S. East Coast sky due to bad weather and three wayward boats in the launch range. Next attempt will be no earlier than late Saturday night/early Sunday (March 24-25). NASA is once again hoping to launch five rockets in just over five minutes — a space barrage that promises to put on a spectacular midnight light show of luminescent vapor trails above the U.S. East Coast — but only if Mother Nature cooperates. After a series of delays due to bad weather and a technical glitch, NASA is now aiming to launch the five-rocket barrage Friday (March 23) after weather concerns thwarted earlier attempts this week. The sky display may puzzle and amaze some unsuspecting observers, so before you call your local news or police, here is why this is happening and when you may see it. The bright phenomenon will be caused by NASA's Anomalous Transport Rocket Experiment (ATREX), which will launch five chemical-bearing suborbital rockets in about five minutes to test the flow of winds and electrical currents at high altitudes. The rockets will blast off from NASA's Wallops Flight Facility on Wallops Island, Va., on the Atlantic coast during a window that opens each at midnight EDT (0400 GMT) and closes at 5:06 a.m. EDT (0906GMT). As part of the experiment, the five rockets will each release a chemical tracer that should inscribe as many as seven brilliant milky white trails in the nighttime sky and allow scientists and the general public to actually "see" high-altitude winds at the edge of space. According to NASA spokesperson Keith Koehler at the Wallops Space Flight Facility, the mission's launch window is driven by two main things. If all goes well, NASA intends to photograph the trails from three different sites: Wallops Island, Tuckerton, N.J., and Duck, N.C. Should weather conditions be unfavorable, the firings will be delayed to another night, with alternate launch dates available through April 3. The rockets were originally slated to launch on March 14, but radio frequency interference on one of the rockets prevented the liftoff. Each night since then, the launch has been postponed because of unfavorable weather conditions at the three viewing sites. Clear skies are required at all three sites to allow for a launch. Weather conditions will be accessed each afternoon and a decision to launch will be made by evening. Three different types of sounding rockets will be used to create the five cloud trails: two Terrier Improved Malemutes, two Terrier Improved Orions and one Terrier Oriole. These small rockets are powerful enough to launch instruments off the planet on short flights, but not strong enough to reach orbit and circle the Earth. Each rocket will eject a stream of the chemical trimethyl aluminum (TMA) which will be illuminated at high altitudes by the sun (which will be below the local horizon at ground level). Initially, the clouds are expected to glow in reddish hues, then quickly turn to white, They could persist in the sky for as long as 20 minutes before fading completely away. The ATREX project is aimed at gathering information to better understand the processes responsible for the high-altitude jet stream winds located 60 to 65 miles (97 to 105 kilometers) above the surface of the Earth. That works out to a potential viewing radius of up to 450 miles (725 km), suggesting that the resultant cloud trails might be glimpsed from perhaps as far north as southern Vermont and New Hampshire, as far south as the border of coastal North and South Carolina and as far west as central West Virginia. The key to making a sighting is to have a clear, unobstructed view of the night sky horizon in the direction of Wallops Island. For example, a viewer in Raleigh, N.C. should look toward the northeast; in Providence, R.I., observers should face southwest; in Philadelphia, Pa., the view will be toward the southeast. The red dots over the water show where the five rockets of NASA's ATREX mission will deploy chemical tracers to watch how super-fast winds move some 60 miles up in the atmosphere. Three cameras at different sites will track the cloud tracers. Looking up along the trajectory from the ground, such trails often appear tangled in complex ways, sometimes resembling a corkscrew shape. Their distorted shape provides scientists with precise data on wind speeds and directions at various levels of the upper atmosphere. The jet stream between 60 to 65 miles above the Earth's surface is much higher than the one commonly reported in weather forecasts. The winds found in this upper jet stream typically have speeds of 200 mph to well over 300 mph and create rapid transport from the Earth's mid-latitudes to the polar regions. This jet stream is located in the same region where strong electrical currents occur in the ionosphere. It is therefore a region with a lot of electrical turbulence, of the type that can adversely affect satellite and radio communications. NASA updates on the mission are also available via Twitter @NASA_Wallops and on the launch center's Facebook page. This map shows the projected area in which the chemical tracers released by the ATREX rockets may be visible to the public. The clouds formed by the chemical tracers may be visible from the North Carolina/South Carolina border up to southern Vermont and New Hampshire and west to central West Virginia. Viewing is dependent on lighting in the area in which you are viewing, cloud cover and also the trajectory of the rocket. NASA used to conduct ion cloud experiments from Wallops Island much more frequently during the 1960s, '70s and '80s, usually in the predawn hours when most people were asleep. Along with trimethyl aluminum, other chemicals such as barium and triethylborane were used, often creating rather exotic colors of red, green and purple. When such launches took place during convenient evening hours they usually took people by surprise. In March 1967, when three clouds were released at around 7 p.m., they were followed by countless numbers of people all along the East Coast calling newspapers and police stations, asking for explanations of the strange sightings. One man described the rocket residue as "red balls of fire" at the time. In January 1975, a barium cloud was released at around 5:30 p.m. in the evening. As luck would have it, the town of Riverhead, N.Y. was hit by a power outage at the very same time that the cloud appeared in the sky. This resulted in a panic among the local residents who believed that the cloud had something to do with the loss of their power. According to accounts, one man called the local police station and shouted: "We’re being invaded! I can see the spaceship in the sky right now ... it's glowing with a greenish color and expanding as it’s draining us of our electric power!" If you snap an amazing photo of the glowing clouds released by NASA's ATREX rockets, or any other sky object, and would like to share them with SPACE.com for a story or gallery, please contact managing editor Tariq Malik at: tmalik@space.com. Editor's note: This story was updated to include the latest launch forecasts for the ATREX rocket launches from NASA's Wallops Flight Facility.